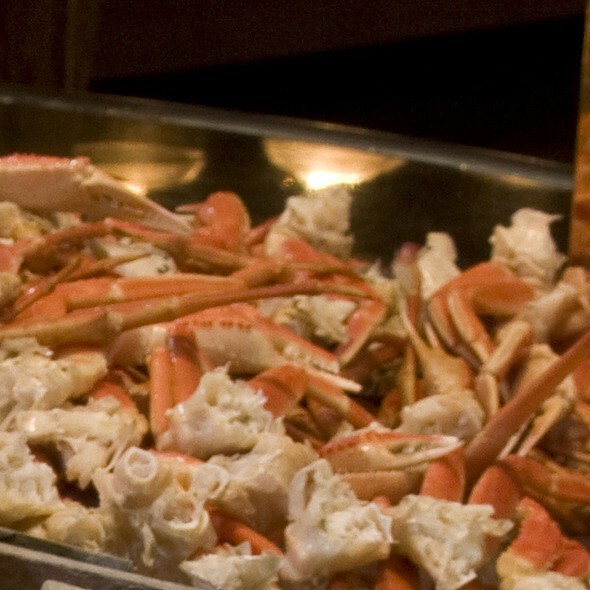 The Zagat Restaurant Guide lists Deer Valley’s Seafood Buffet in "America's Top Restaurants"– and after one visit, you’ll understand why. 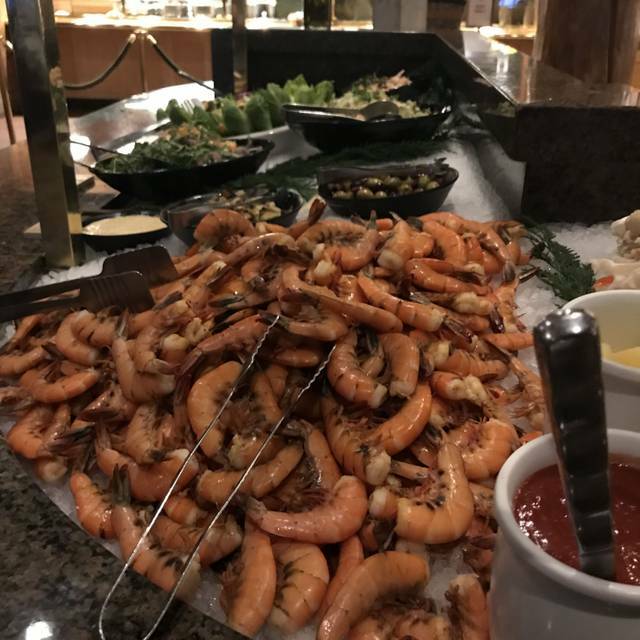 Seafood Buffet offers a vast array of fresh seafood including poke bar, chilled shellfish, hot seafood appetizers and entrees, carvery specials, prime rib, vegetable specialties and fabulous desserts and so much more as the menu changes weekly. Deer Valley is proud to support sustainable of our oceans. Located on the plaza level of Snow Park Lodge. Adults $75, Children $30 (6-11 years). Prices do not include beverages, tax or gratuity. Corkage fee is $20 per 750ml bottle for the first two bottles, $40 per bottle for any additional bottles. Magnum corkage is $35. I'm so happy they got a new chef. Honestly, two years ago the buffet was just awful and now it is back to great. The new ice cream buffet was really good, the crab was VERY good quality, the cheese tray and bread are back up to snuff. Only thing I miss is the old version of clams and mussels, but that is not important compared with all of the other upgrades. If I were to suggest something, the fish station is still a work in progress. The scallops had no color (and subsequently no flavor) at all, the halibut was overcooked as were the langostines. I imagine that it is very difficult to successfully put fish in a buffet. The gnocchi (which your server referred to as "nock-ee") were gummy but the pea risotto was good. My goal is to eat around the fish station and stay a happy camper. PS - the mashed potatoes? Did you steal Joel Robuchon's recipe? Outstanding. We have been going frequently for over 20 years and hope that it will continue to be a Deer Valley favorite offering! Overall, food (cold and hot) was okay. But if you like king crab legs, you should visit this place. 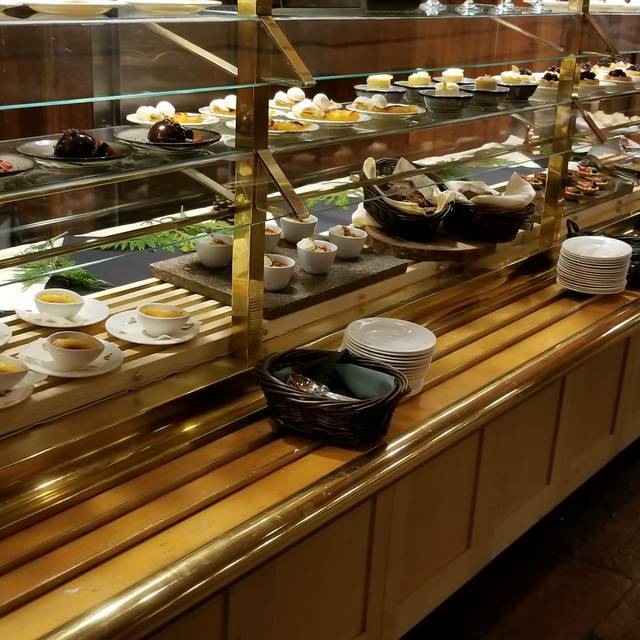 The dessert station was good, and they add(testing out) ice-cream station this season which I think they should make it permanent. Very friendly staffs always ensure to clear up the plates when you finish. Thank you very much for making us aware of your experience at Deer Valley Resort. We apologize that your experience did not meet your expectations. We have passed your comments on to Deer Valley's management team and the Director of Food and Beverage. Never again, not even the great service could save this dining experience, poor quality of food, cold mushy seafood, dry fish, greasy fried foods, so many great restaurants in Park City, a void this one at all cost!! We sincerely apologize that your experience was not a good one. Please be assured that your feedback has been shared with our management team as we do take guest input to heart. Our goal has always been to provide the best possible experience for all of our guests and we appreciate your feedback. 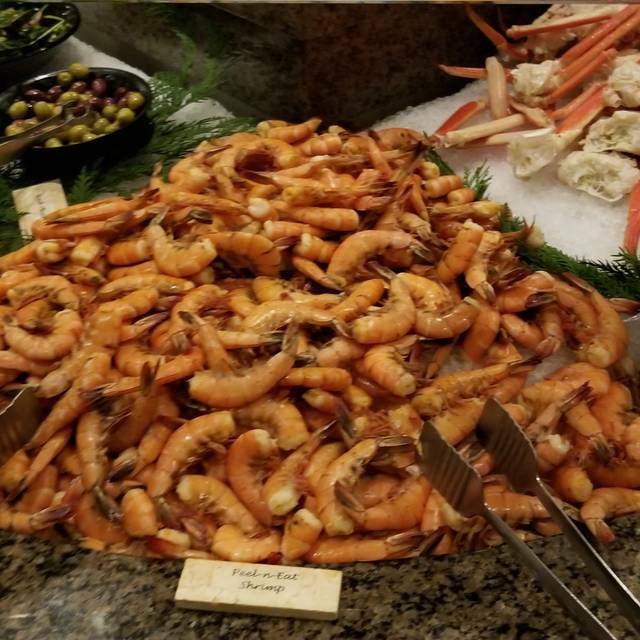 Seafood Buffet never fails to meet expectations.. it's Deer Valley, enough said. Used to be awesome. This time unfortunately did not live up to its standards (we’ve been coming here for a decade). The seafood was amazing but there were a lot of tables around us not bussed and they were slow to get us drinks and take plates away. It just didn’t seem to be worth the price, especially $30 for my 6 year old that had two bites of Mack & cheese and one helping of potatoes plus two deserts. Fantastic selection of seafood. All very fresh and unique fish dishes. Loved the oysters, crab, clams and sable fish. Highly recommend. This is a wonderful all you can eat seafood buffet! 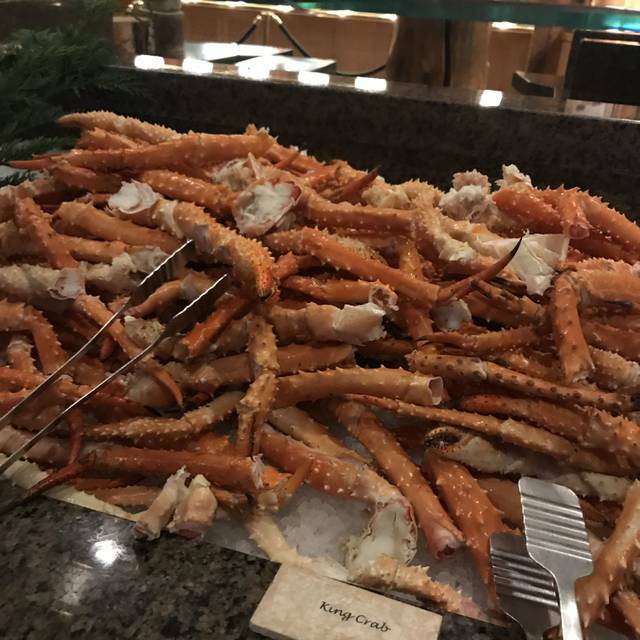 every year that we are skiing at deer valley resort we make a reservation to dine at the seafood buffet. it is always a highlight to our trip. the service is beyond great. they are always right there to take away dirty dishes and utensils before we head back to the buffet for the next course. when we started going to the seafood buffet it was offered only one or two nights a week, which made it more of a special occasion meal. today, it is offered many more nights so it has lost its sense of being a special event. For the price, the seafood was not the high quality it use to be. Very disappointed. Some of the hot food from the other areas were burned and not very tasty. The desserts were very good. 2nd year dining here. All-in-all and excellent experience. Some of the folks manning the food stations didn't really have a command of English making some orders awkward. Seafood was wonderful but some of the other dishes disappointed. The pasta dish was a congealed mess that had been sitting under the heating lamps for too long and the duck was overcooked and dry. Overall a pleasant event with great seafood! This is an experience. Come HUNGRY! Also if possible sit upstairs, the more walking you can so the better. Truly an incredible selection of seafood. Very good, fresh and nicely presented. 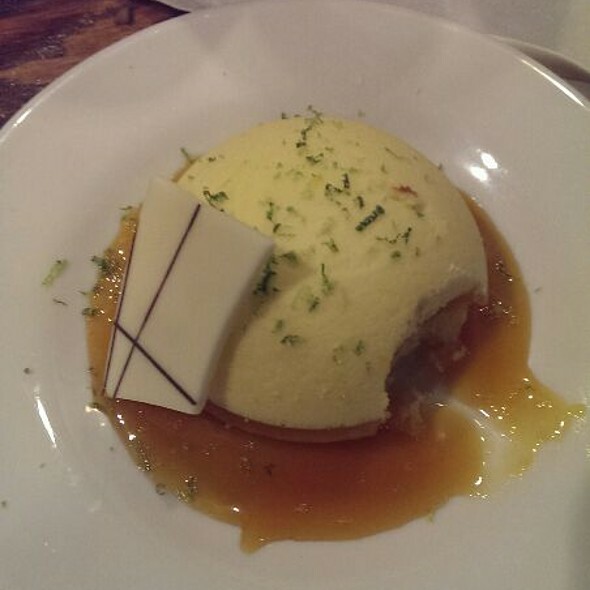 Great desserts too. But you’ll have to save room. Wonderful find in Utah. My wife and I moved to Utah from the east coast so getting good seafood around here has been difficult. My wife found this location while we were in the area skiing and very happy with the quality and selection of the food as well as the price. We defiantly got our money’s worth since we both love oysters and crab legs. The harpist was lovely and added to the beautiful ambiance of this dinner buffet. We came to celebrate my dad and brother's birthday, the buffet was great as usual, but their poke was ok. Their sable fish was a huge hit with the family. They made my dad and brother feel so special. The service was great and could not say enough great things about Anja and her team. Thanks for a great time! We had a fantastic time and great food!! The staff was very courteous and friendly! We are looking to make it a yearly date. For what is represented as a high end luxury experience, you are eating in a woody, very casual setting which is a buffet. An interesting selection of foods from warm as well as cold apps, soups and salads to various entree choices. Interesting that more veggie sides aren’t offered and all the entree portions are small. Eclectic variety of desserts. Pleasant server. For the price, it’s just not worth it. And then they have the nerve to offer a lobster tail for a $20 upcharge. $300+ tax and tip for a family of four. Wouldn’t recommend it and won’t do it ever again. Hi Greg, thank you for taking the time to send us your feedback. We have passed your comments on to Deer Valley's management team, the Director of Food and Beverage, and the staff at Seafood Buffet. We offer a separate vegan option that is served a la carte for those that would like it. As you know, we try to offer a guest service experience that goes above and beyond guest expectations and without feedback like yours we cannot improve upon these situations. Thank you again for sharing. Our server, Tiffany, is very special. She served us on two occasions. Both times, she was amazing. Parents were in town! It’s our annual tradition. We have gone to the Seafood Buffet annually for a number of years. Service was not quite a good this year. Had to keep requesting silverware. 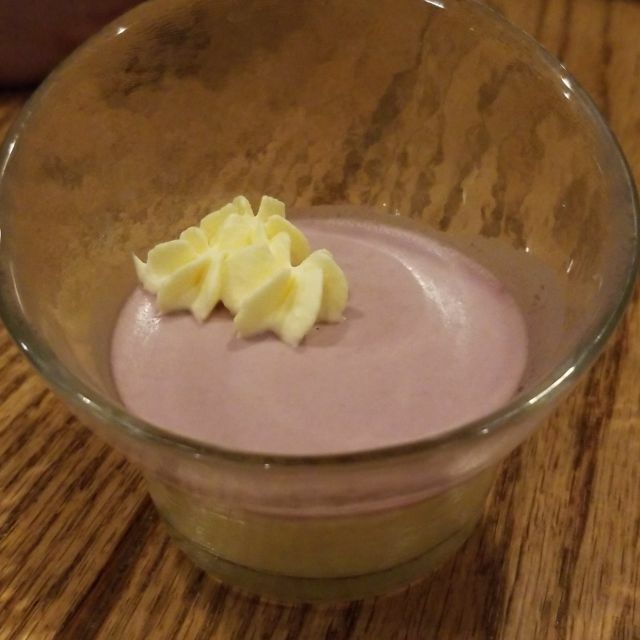 Desserts were also not as impressive as they have been in the past. Thank you for taking the time to send us your feedback from your visit to Seafood Buffet. Our goal has always been to provide the best possible experience for all of our guests and we appreciate your feedback. We have passed your comments on to Deer Valley's management team and the Director of Food and Beverage. Thank you again for sharing. We were disappointed that there was no sushi and some of the food just wasn't very good. We've been several times and we were disappointed this time. The service was less than mediocre which really shocked me. Hi Christi, thank you for the feedback. It has been many years since sushi was on the menu. We added the poke bar as it was more desirable for the majority of our guests. Please be assured that your feedback has been shared with our management team as we do take guest input to heart and that we will continue to work with our staff to improve our offerings and service. Excellent food, service and atmosphere! Enjoyed eating great food and the ability to talk to each other without yelling. I have been going to the seafood buffet for MANY years, typically 2 times/year. 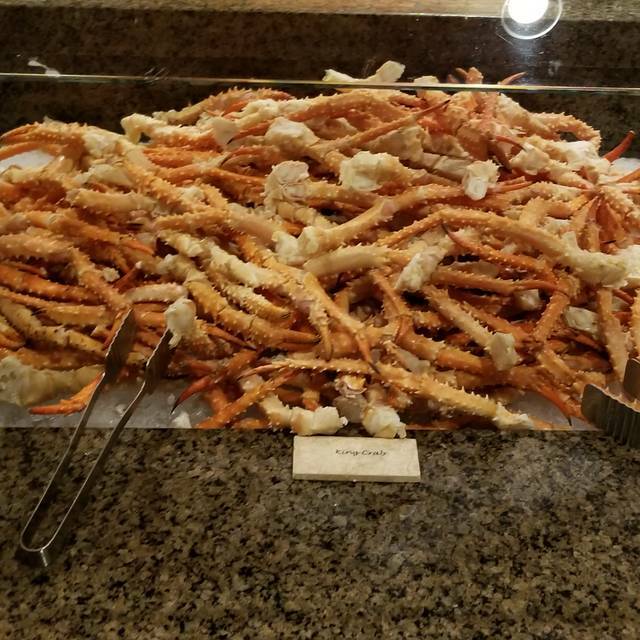 TWO ISSUES on Monday, Feb. 25th: 1. the King Crab legs had VERY sharp spines on them, and were literally painful to hold into unless you wrapped the leg in a napkin first. This has never happened before, and was very annoying! They should not have been served. 2. There is a NEW CORKAGE program. $20 corkage for wine you bring in, for the first 2 bottles. $40 per bottle for additional bottles. Ouch!!! and $35 for a mangnum. We had a very nice evening at the Seafood Buffet. I'm not a big fan of buffets in general because I just can't eat enough food and I hate leaving feeling stuffed and bloated. This trip to Deer Valley was a women's ski trip and having already taken part in the Deer Valley's Fireside dining with my family and truly loving that experience, I decided to arrange this with my girlfriends and hoped it would be as good. The seafood and service with very good but the ambience was not as wonderful as Fireside Dining; and yes, all of us ladies did stuff ourselves and left feeling bloated! Overall, I probably would not do this dining experience again with a group of ladies. We just couldn't eat enough to justify the price and the ambience was good but not great. We enjoyed drinks and apps at the St. Regis the night before and had just as much of an experience and spent half as much and we were all happier. We have been enjoying the seafood buffet for over 25 years. This is the first year I noticed a slight dip in quality. For example the baby ribs have changed and they added the sauce later - not cooked on. I was very disappointed in the cilantro glaze ribs not tasting as good. I also missed the sushi. The crab legs continue to be served cold and the drawn butter isn’t warm enough. I will say that they improved the bread pudding though! (They also increased the cost). I suggest they get the quality back up as I expect they will. Always love the service at DV though. I feel like it was better previous years, but we still add this to the list every year. I have been visiting Deer Valley for the last 5 years. The dining experience and quality of the food at the Seafood Buffet has always been outstanding. This year the quality of the product has decreased. The raw bar was decreased in quality, appearance and presentation. The selection and presentation of the cheeses has degraded as well. The $20 per bottle corkage charge seems outrageous and exorbitant. The buffet is an expensive indulgence for a family of 6 or 8 which has always felt worth it. This year fell well short of expectations. We'll probably not be back. Thank you very much for making us aware of your experience at Seafood Buffet. We apologize that your experience did not meet your expectations. We have passed your comments on to Deer Valley's management team, the Director of Food and Beverage, and the team at Seafood Buffet as we do take guest input to heart. As you know, we try to offer a guest service experience that goes above and beyond guest expectations and without feedback like yours we cannot improve upon these situations. 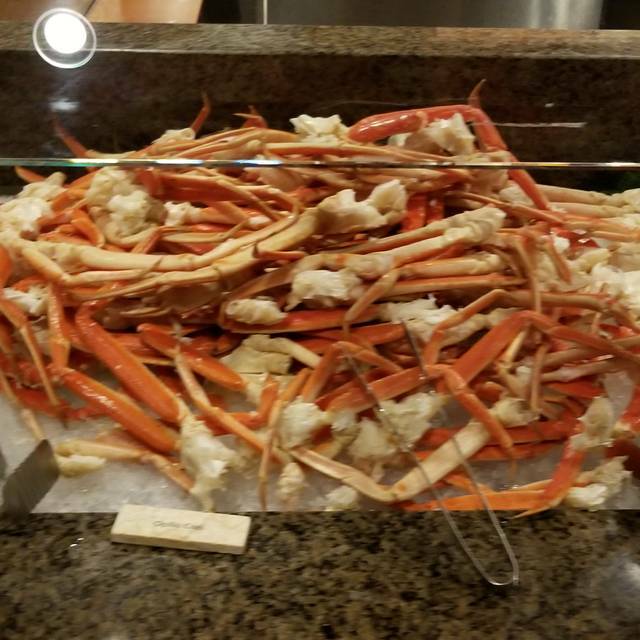 I love hitting up the seafood buffet at least once during ski season. There is a wide variety of delicious food, even if someone in your group isn’t into seafood. The only thing I don’t like is all the shellfish has to be peeled or cracked myself. Everything was great. We arrived early and were accommodated early. Our server was exceptional and the food was fabulous. We left full and happy. We will definitely be back next year. Absolutely fantastic food, worth every penny. We will absolutely be back for another special occasion! The food is consistently excellent and the wait staff is attentive and friendly. I find the room to be chilly and a little blah. Corkage fee for the first two bottles is $20, and then it goes to WTF $40?! Are you kidding me? All in all, a very nice evening. Always a great feast. Service was attentive. Could have used some music to make the atmosphere less stark. Overall Food was great. Seems to be a little less in terms of choices from what it was in the past, but still plenty of food and options. Has gotten pricey, as $75 no alcohol included is a pretty high price point now.